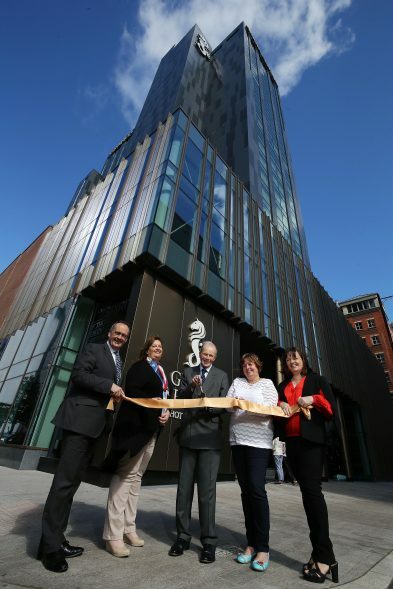 Press Eye - Belfast - Northern Ireland - 20th June 2018 - Opening of the Grand Central Hotel The Directors of Hastings Hotels Howard Hastings, Allyson McKimm, Edward Carson, Julie Hastings and Aileen Martin pictured outside of the Grand Central Hotel as the largest and most expensively constructed hotel project ever seen in Northern Ireland opens its doors today for the first time. Photo by Kelvin Boyes / Press Eye. 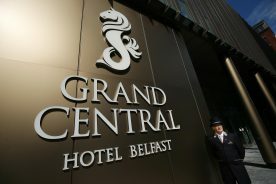 TODAY sees the opening of the Grand Central Hotel, the largest and most expensively constructed hotel project ever seen in Northern Ireland. 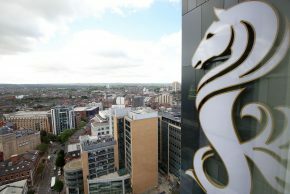 Residents of Belfast have watched over the past two years as Windsor House has transformed from an unloved office block to the key feature on Belfast’s skyline, with its unmistakeable Seahorse logos and shimmering charcoal panels visible across the city. 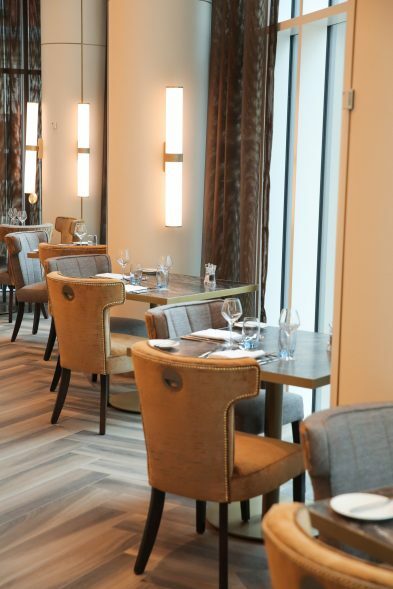 The Northern Ireland hotel scene is enjoying a period of rapid expansion, and the 300 opulently appointed bedrooms in Grand Central mark the greatest leap forward to date. 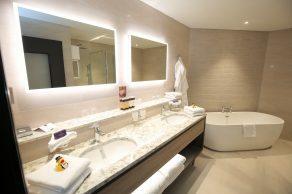 The hotel is much more than this, though. 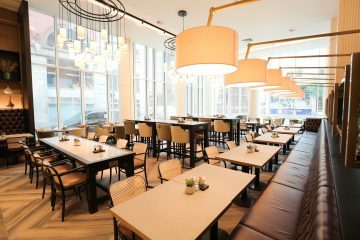 With its dramatic “double height” space on the ground and first floor levels, it is international in outlook, and cosmopolitan in feel. 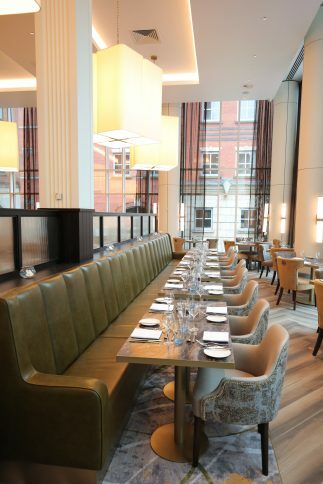 No expense has ben spared on its marble flooring, its plush fabrics and its dramatic interior lighting. 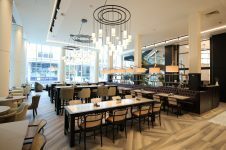 The £53 million committed to this project by Hastings Hotels has created an unmistakeably upscale venue for locals and visitors alike. 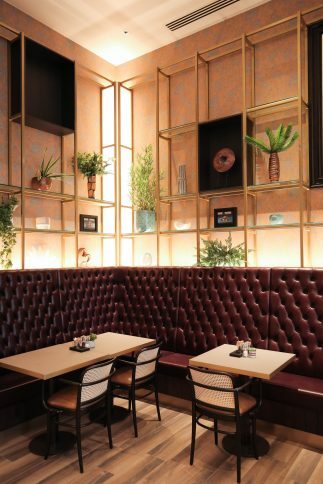 It is a hotel which exudes personality, with its bedroom suites paying homage to the Linen Barons who first occupied the Linen Quarter in which the Grand Central sits, to Sir William Hastings, the founder of the Hastings Hotels Group who have delivered this new project. 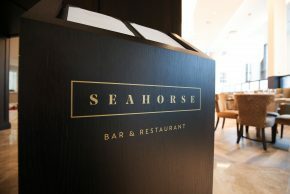 Its dining options range from the city chic Grand Café on the ground floor, to the design led Seahorse Bar & Restaurant overlooking Bedford Street, to the small plates cocktail lounge on the 23rd floor, which has been named The Observatory. 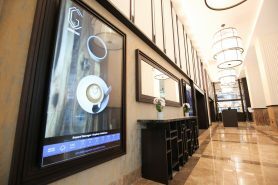 A poem has been commissioned to mark the Hotel’s arrival. 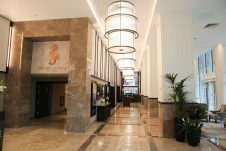 Snippets of it are etched into the pavement at the hotel entrance, and in a metal fretwork screen. 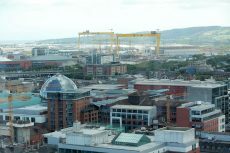 It is by one of Northern Ireland’s leading poets, Paul Muldoon, who used to work in the building when at the BBC in the 1980s. 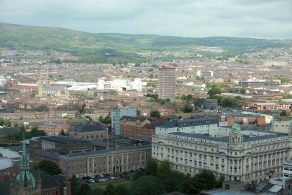 It is entitled “Hymn to Belfast” and speaks to the new era in which Belfast now finds itself, acknowledging its past glories, and the spirit of its kinsfolk who are now transforming its fortunes once again. 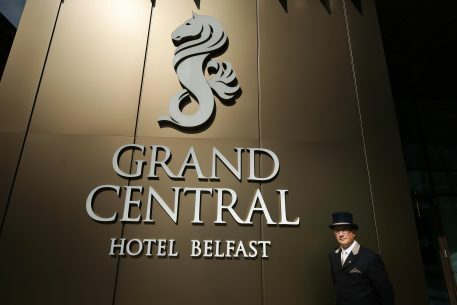 The Grand Central’s personality is further enhanced by its sense of being at the epicentre of all that is Belfast, adopting as it has the Seahorse logo which in turn belonged to the “old” Grand Central Hotel in Royal Avenue. 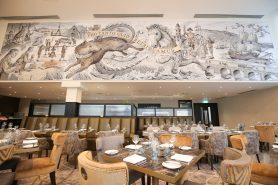 This Seahorse is most vividly depicted in the hotel’s main restaurant in a specially commissioned eye-catching illustration which deconstructs the official Belfast crest, featuring Chichester’s wolf and the Seahorse and their contribution to the founding of the City. 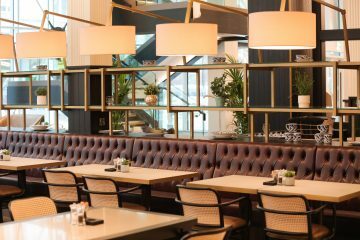 The Hotel has been constructed on time and on budget by local builders Graham’s of Dromore, with design being led by Belfast architects RPP. 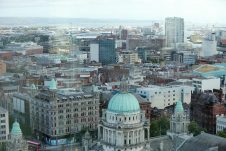 The Bank of Ireland has assisted with project funding. 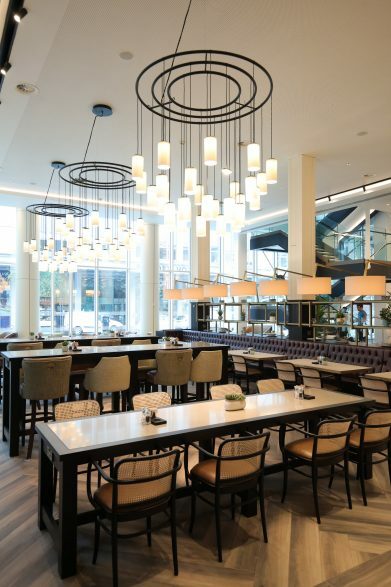 Many local firms can take great credit for their part in ensuring the doors open today. 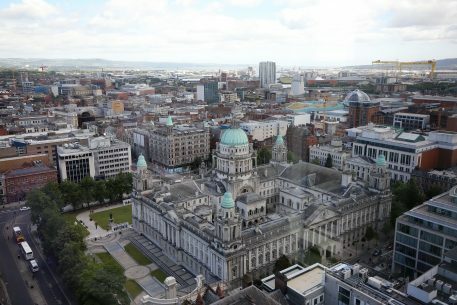 Press Eye – Belfast – Northern Ireland – 20th June 2018 – Opening of the Grand Central Hotel General view of Belfast city centre taken from the 23rd floor of the new Grand Central Hotel. Photo by Kelvin Boyes / Press Eye. 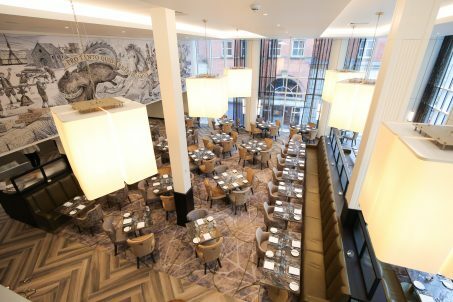 Press Eye – Belfast – Northern Ireland – 20th June 2018 – Opening of the Grand Central Hotel General view of the lobby area. Photo by Kelvin Boyes / Press Eye. 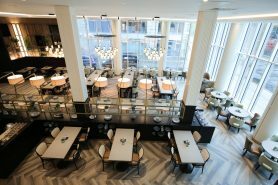 Press Eye – Belfast – Northern Ireland – 20th June 2018 – Opening of the Grand Central Hotel General view of the the Grand Cafe Photo by Kelvin Boyes / Press Eye. 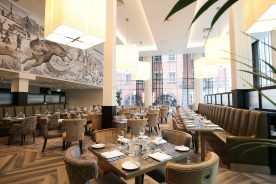 Press Eye – Belfast – Northern Ireland – 20th June 2018 – Opening of the Grand Central Hotel General view of the Seahorse Bar and Restaurant. Photo by Kelvin Boyes / Press Eye. 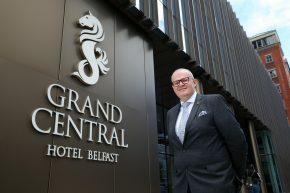 Press Eye – Belfast – Northern Ireland – 20th June 2018 – Opening of the Grand Central Hotel Stephen Meldrum, General Manager of the Grand Central Hotel pictured outside the hotel. Photo by Kelvin Boyes / Press Eye. 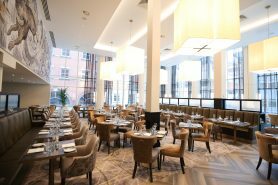 Press Eye – Belfast – Northern Ireland – 20th June 2018 – General view of the Grand Central Hotel Photo by Kelvin Boyes / Press Eye. 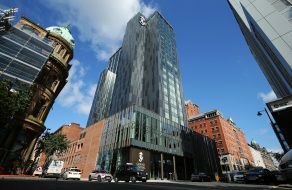 Press Eye – Belfast – Northern Ireland – 20th June 2018 – Opening of the Grand Central Hotel The Directors of Hastings Hotels Howard Hastings, Allyson McKimm, Edward Carson, Julie Hastings and Aileen Martin pictured outside of the Grand Central Hotel as the largest and most expensively constructed hotel project ever seen in Northern Ireland opens its doors today for the first time. Photo by Kelvin Boyes / Press Eye. 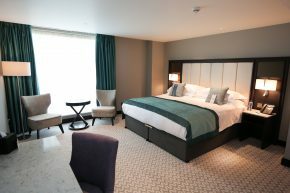 Press Eye – Belfast – Northern Ireland – 20th June 2018 – Opening of the Grand Central Hotel General view of the bedroom ensuite bathroom. Photo by Kelvin Boyes / Press Eye. 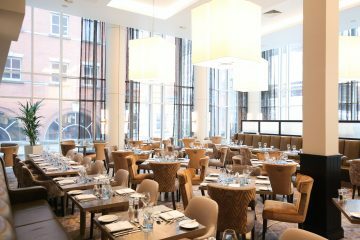 Press Eye – Belfast – Northern Ireland – 20th June 2018 – Opening of the Grand Central Hotel Photo by Kelvin Boyes / Press Eye. 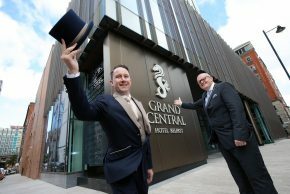 Press Eye – Belfast – Northern Ireland – 20th June 2018 – Opening of the Grand Central Hotel Jonathan Wade is joined by Stephen Meldrum, General Manager of the Grand Central Hotel as the largest and most expensively constructed hotel project ever seen in Northern Ireland opens its doors today for the first time. Photo by Kelvin Boyes / Press Eye. 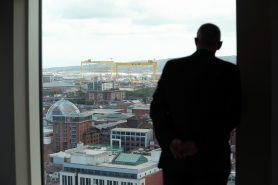 Press Eye – Belfast – Northern Ireland – 20th June 2018 – General view of the Grand Central Hotel John Dodds outside the hotel Photo by Kelvin Boyes / Press Eye. 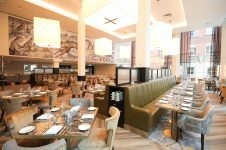 Press Eye – Belfast – Northern Ireland – 20th June 2018 – Opening of the Grand Central Hotel The Directors of Hastings Hotels Howard Hastings, Julie Hastings, Edward Carson, Aileen Martin and Allyson McKimm are joined by Stephen Meldrum, General Manager of the Grand Central Hotel as the largest and most expensively constructed hotel project ever seen in Northern Ireland opens its doors today for the first time. Photo by Kelvin Boyes / Press Eye. 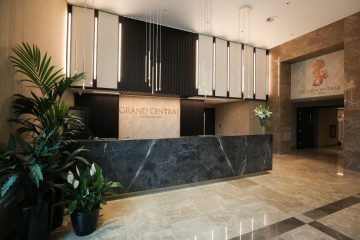 To enjoy a stay at the Grand Central Hotel go to www.grandcentralhotelbelfast.com or call 028 9023 1066.